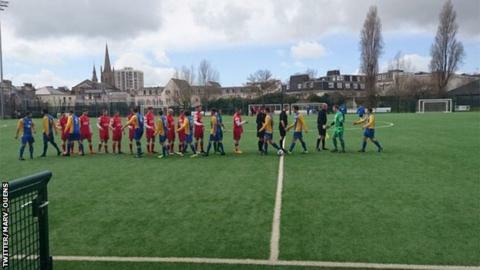 Jersey side St Ouen completed a second-half comeback to beat Guernsey Sylvans 4-2 and lift the Wheway Cup. The hosts were behind at half-time to set-piece goals from both Aaron Ferbrache and Sam Murray. However, substitute Martyn Sansom scored twice for St Ouen, with Stewart Daynes and Dom Glennon also on target. "Credit to the boys, I asked them to deliver and they've done so fantastically," manager Peter Flambard told BBC Radio Jersey. "To score four goals in the second half, keep that clean sheet and win it, I'm delighted - I couldn't have asked for more in that second half. "It justifies the hard work that the lads put in to try and build something. This is the reward that we get for it and we're going to enjoy this for a long time." It was an historic victory for Jersey's Western Parish club, winning the cup for the first time in their history.